The US is expected to start deliveries of liquefied natural gas at the end of the year, a move aimed at loosening European dependence on Russian energy, said Amos Hochstein, US State Department Coordinator for International Energy Affairs. The first shipments will be delivered to India and Japan, but other markets are likely to emerge in the near future, Hochstein said during a talk at the Atlantic Council on Thursday. He believes the plans will affect the situation in the global energy markets. Hochstein supported the Third Energy Package and called for construction of an LNG receiving hub in Croatia. “There are some projects that I’ve been publicly advocating for that I believe would be positive. One of them is an LNG facility in Croatia. I really believe that it’s a critical node,” he said, adding that the hub would help diversify energy supplies in neighboring Slovenia and Serbia, as well as other countries in the region, including Hungary and Ukraine, which currently dependent on a single source. 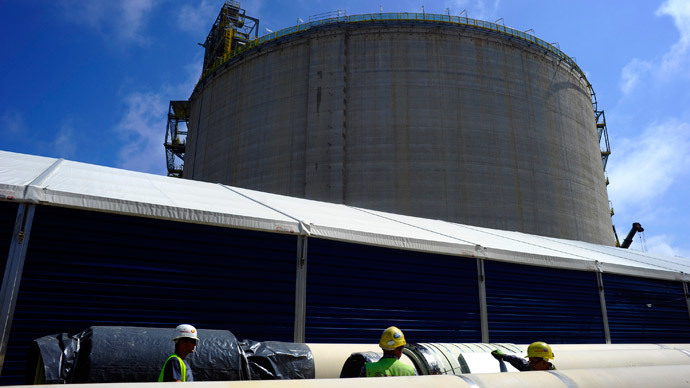 Earlier in December, Croatia restarted a decade-old project of building an LNG import terminal. The idea was abandoned amid the fall of demand for gas during the global financial crisis, but after the cancellation of the South Stream the project was revived as an attempt to reduce dependence on Russian gas. The US and the EU have long been discussing loosening Europe’s dependence on Russian energy sources. The talks became more intense amid geopolitical tension over the crisis in Ukraine. Western countries have repeatedly suggested imposing sanctions on Russia in the energy sector. Russia and Europe disagreed over the construction of the South Stream gas pipeline, which was planned to deliver 63 billion cubic meters of gas to Europe. The EU believed Russia didn’t meet the third energy package regulations, which stipulates that a single company can’t both produce and transport oil and gas. As a result, in December Russia announced the cancellation of the South Stream project. Now Gazprom is going to use the already constructed South Stream infrastructure in Russia to build a new gas pipeline across the Black Sea to Turkey. With new major players emerging in the global energy market, the world production capacity of LNG can at least double by 2020. The construction of 20 LNG plants with total capacity of up to 200 million tons per year has been claimed in North America. Ten plants (six in the US and four in Canada) have already received export licenses for 100 million tons per year. In this way the US can increase the supplies of LNG to 45 million tons per year by 2020 with around a third of the volume directed to Europe, according to the Skolkovo innovation center experts’ estimates. However, it doesn’t mean that European countries will be able to automatically substitute half of Russian gas imports, said Grigory Vygon, director of Skolkovo business school’s energy center, according to the Novaya Gazeta newspaper. Even if the US government issues export license for each of the applicants, it cannot force the companies to deliver all their production to Europe. Businesses are likely to choose the most profitable market for themselves, and Vygon believes that in terms of prices it’s going to be the Asia-Pacific region. The current US goal of increasing LNG supplies to Europe can be adjusted by domestic demand, he believes. The fact is that the boost of gas exports from the United States will destroy the current domestic oversupply and lead to rising gas prices in the United States. According to the EIA, the price of gas in the domestic market will grow by about 35-40 percent to $6/MBTE five years after the US launches deliveries overseas.